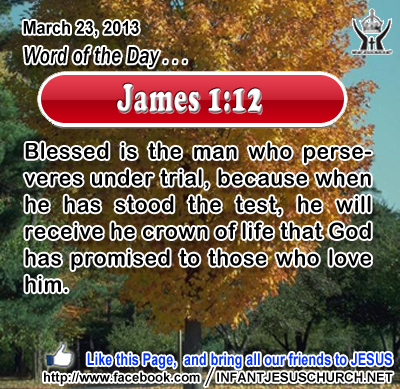 Ephesians 6:10-11: Blessed is the man who perseveres under trial, because when he has stood the test, he will receive he crown of life that God has promised to those who love him. Heavenly Father, thank you for giving us the assurance that when all is said and done, we will share in your life and your victory forever. Help us this day to live confidently, knowing that we have your life. In the name of Infant Jesus we pray. Amen. 45Many of the Jews therefore, who had come with Mary and had seen what he did, believed in him; 46 but some of them went to the Pharisees and told them what Jesus had done. 47So the chief priests and the Pharisees gathered the council, and said, "What are we to do? For this man performs many signs. 48If we let him go on thus, every one will believe in him, and the Romans will come and destroy both our holy place and our nation." 49But one of them, Ca'iaphas, who was high priest that year, said to them, "You know nothing at all; 50you do not understand that it is expedient for you that one man should die for the people, and that the whole nation should not perish." 51He did not say this of his own accord, but being high priest that year he prophesied that Jesus should die for the nation, 52and not for the nation only, but to gather into one the children of God who are scattered abroad. 53So from that day on they took counsel how to put him to death. 54Jesus therefore no longer went about openly among the Jews, but went from there to the country near the wilderness, to a town called E'phraim; and there he stayed with the disciples. 55Now the Passover of the Jews was at hand, and many went up from the country to Jerusalem before the Passover, to purify themselves. 56They were looking for Jesus and saying to one another as they stood in the temple, "What do you think? That he will not come to the feast?" It was Jewish faith that when the high priest asked for God's counsel for the nation, God spoke through him. A dramatic irony that Caiaphas prophesied that Jesus must die for the nation. The prophet Ezekiel announced that God would institute one people, one land, one prince, and one sanctuary forever. Luke adds to Caiphas’s prophecy that Jesus would gather into one the children of God who are scattered out of the country. Jesus came to lay down his life for the many, but not in a silly reckless manner so as to throw it away before his work was done. He retired until the time had come when not anything would stop his coming to Jerusalem to fulfill his Father's mission. Loving Infant Jesus, may we your disciples be ever ready to lay down our lives in conformity to your will, to willingly suffer and die for you, that we may also share in your triumph and glory.